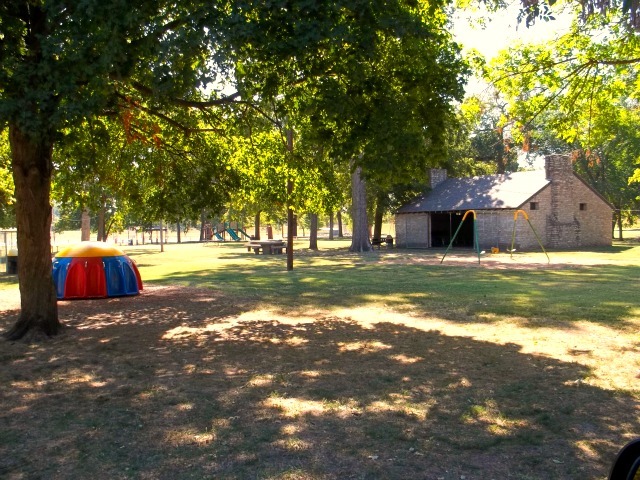 Located east of the beautiful Neosho River and southwest of downtown Iola is the magnificent Riverside Park that has been in existence almost 150 years. The city purchased the park from the fair board because of its wooded area and magnificent oak trees. It was thought this was a perfect place to have people come to relax. It wasn't until the WPA projects were built that Riverside Park received the beautiful football stadium, pool, pool building, community building, shelters, and one baseball diamond. 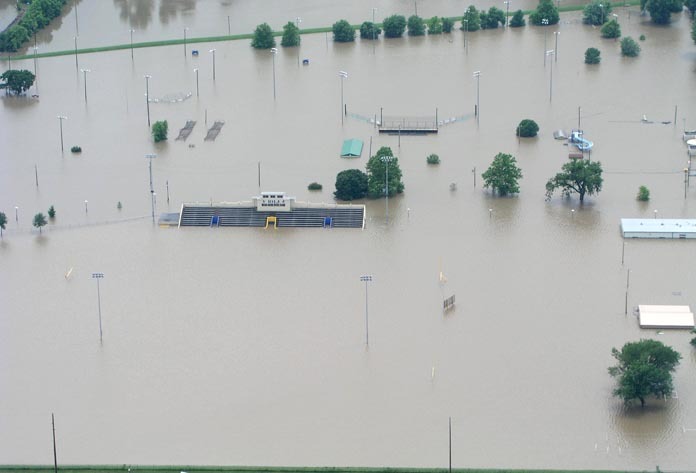 Through the years, the park had many amenities added to it, especially after the devastating flood in 2007. In 2007 Iola experienced a flood that broke through a railroad bed on the east side of the park, causing Elm Creek waters to fill the park. The dike of the Neosho River, having been built years ago, stood strong and kept the Neosho River at bay, but the park was in ruins. After the flood, everything had to be renovated because the water was caught inside Riverside Park like soup in a bowl. After the massive cleanup, the community building and old pool were gutted and newly renovated. Happily, the city of Iola was able to keep the integrity of the WPA buildings and pool house. 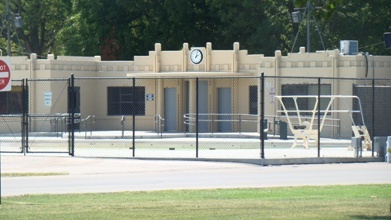 The WPA pool was one of the largest pools in Kansas, and because of its size, a new swim meet regulation size pool and a zero entrance, along with many other modern amentites, were built inside of the old pool. A lot of the playground equipment was cleaned up, and some had to be replaced. 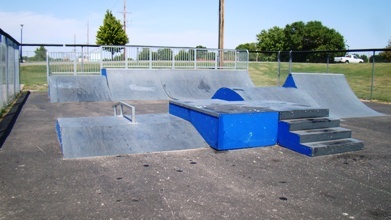 The wooden skate park had to be renovated after the flood since the wood was contaminated. Now, it's a beautiful plastic and metal skate park. As with most disasters, after the shock and cleanup, things sometimes come out to be better than they were before! 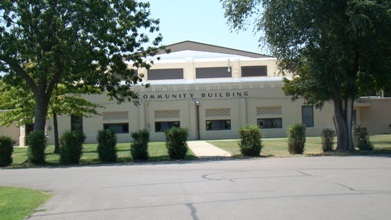 The community building was built by the WPA program for the national guard armory. 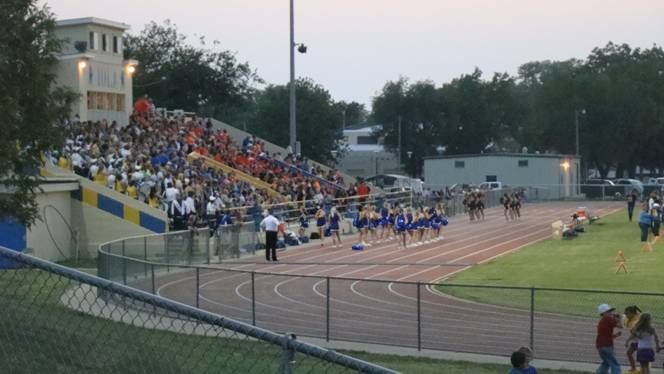 By 1941, it was changed to a basketball court and a small theater which was used by the school system for many years, as well as clubs, organizations and citizens of the community. After the school district built their own gymnasium, the community building is being used for indoor exercising, pick up basketball, and an area that's available for many uses. Also, the Allen County Fair uses the building every year as does the Iola Chamber of Commerce for their EXPO. There is a lot of playground equipment (some over 60 years old, as well as new items) that are located within the park. A lot of picnic tables, shelters, grills and trees! 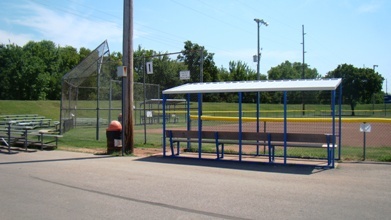 The park also has six ball fields for the young and old to use. Batting cages, and pitching machines are also included in the baseball complex. Just to the south of the current football field are new sports fields available for different levels of softball and baseball. The fairgrounds include a petting barn, animal pens, a show and rodeo arena with bleachers, and many other amenities. The baby barn and petting area were renovated when the parents of David Stanley, a 5 year old who died with brain cancer, had the baby barn rebuilt with memorial funds. 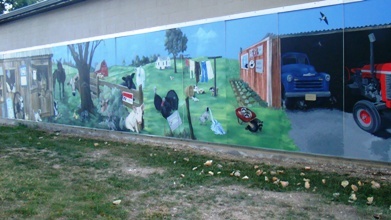 One of the most enjoyable items to visit just south and east of the baby barn is the beautiful mural that was painted on the north side of the new city building, which was built in 2010. This building is used for meetings, dinners, etc. Take time to leave your car and get an up-close look at the treasures painted into the mural. This is a must see!